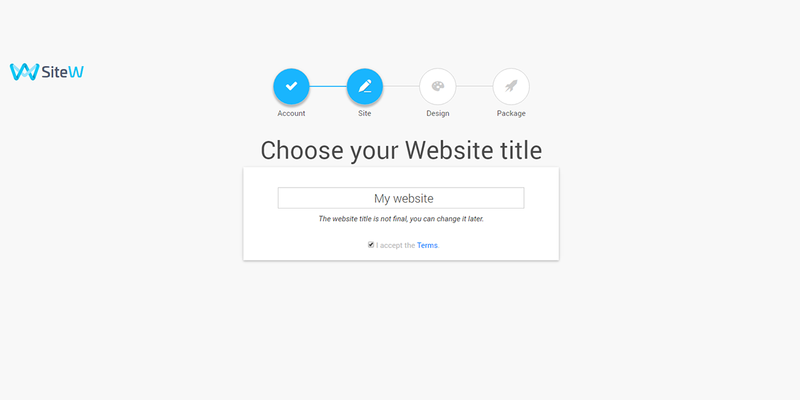 This tutorial explains how to create your website in 5 simple steps. You just arrived on SiteW.com and you want to create your website for free? Then follow these 3 easy steps which allows you to create your website. Enter your email address, choose a login (which allows you to enter in the member area) and a password. Warning, double check your email address! Once your account is created, you will receive an email asking you to confirm your email address in order to validate your new account. Then you can move on to step 2. Enter the name of your website. Are allowed lower case letters from a to z, numbers, dots "." and dashes "-". For example, "Guest house in Dublin", "Hotel in London" or "Surfing in California"... If, later you choose the Premium package or the Pro package, you will be able to order your own domain name! Your address will not end with .sitew.com but with .com, .net or .org (for more seriousness and profesionnalism for your website). Choose a design that fits best with your website. Each design is available in hundreds of colors. You can preview the website by placing the mouse cursor over the colors. The screenshot is automatically updated. Once decided, click on the design and on the color you like. Its frame becomes blue, indicating that your choice is accepted. Then, go to the last step by clicking on the "Next" button. 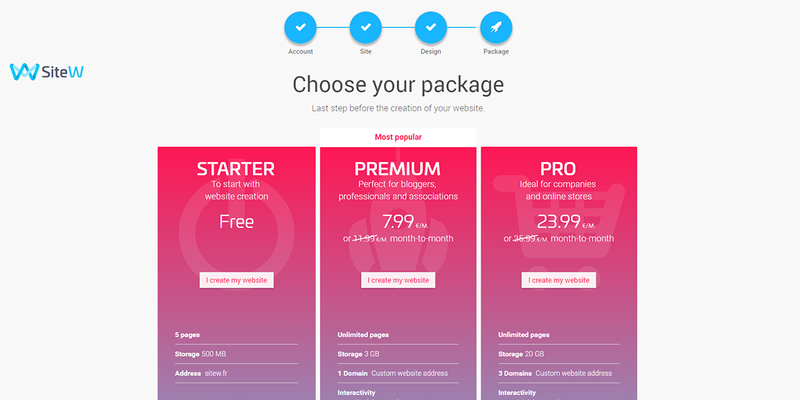 Then, choose a package for your website. You can test the Premium and Pro packages for free during 15 days! The Starter Package is absolutely free. 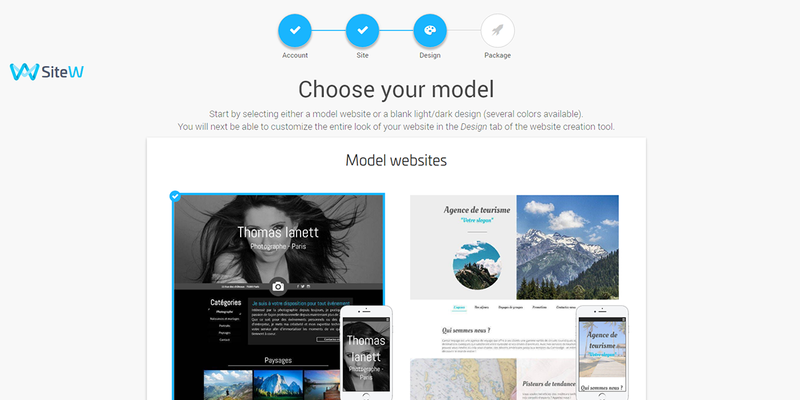 It offers a few designs for your website and the basic blocks: text, image, photo gallery, video, google map and menu. The Premium Package offers many more designs and Premium features allowing you to create an interactive website: visitors' comments, contact form, music, flash animation, calendar. You can create as many pages as you want and store files up to 6GB. Moreover, with the Premium package, you have your own domain name (for example, http://www.my-company.com). The Pro Package allows to create an unlimited amount of pages on your website. It includes all the Starter and Premium services, and more designs and blocks. You can store up to 20GB of files. Finally, as with the Premium package, your website can have its own domain name. For more information about the packages, please check the page: SiteW packages. Once the form is filled, submit it. You are then automatically redirected to the website creation tool. 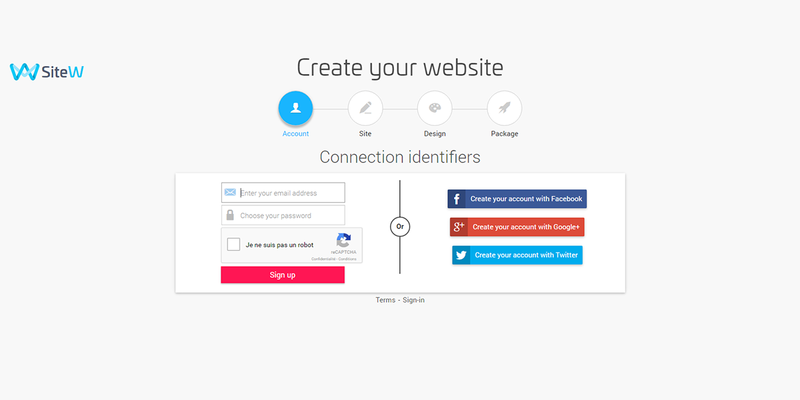 To know more about the website creation tool, have a look at its tutorial: Website creation tool. With SiteW, creating your website is fast, easy and free. How To Create A One-Page Website With SiteW?